If you happened to read Thursday’s mostly superfluous post of inane trivialities pertaining to my life, you’ll recall that my awesome postal delivery professional left a red sleeve with the Underworld: Awakening Blu-Ray in my mailbox. Now, because I’m basically a 13 year-old most of the time—especially when it comes to movies—I obviously chose to stay up much too late on a school night to watch it. What’s that, you asked? What did I think of it? Well, I suppose I could give you a trademarked* Puddintopia “A movie in 100 words” review, since you asked and all. If you ask nicely and promise to eat your vegetables. Mmm…broccoli, right? Fine, here you go. Underworld: Awakening – Is it possible to like and dislike something simultaneously (besides family members)? That’s how I feel about Underworld: Awakening. It gave me tingles** to see Kate Beckensale don Selena again, but as a movie, I was disappointed. The story arc was okay—I’m mostly fine with this as canon—but the delivery was meh. There were lots o’ hard-to-swallow plot-leaps wedged between overdone actiony bits. And it’s all based on Gigantic Plot-Bomb that’s dropped and then, like, “Oh! HAI! You need to believe <REDACTED>, okay? Swell. Shush! No questions.” Verdict: Yeah, I’ll watch it again. But it could’ve been better. 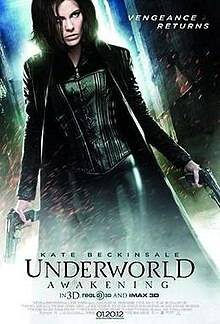 The bottom line is, if you’re an Underworld fan, I’d recommend checking it out at the very least. It isn’t fanboy-squee-awesome, but I did like it better than the previous (and sadly Selena-less) episode, Underworld: Rise of the Lycans. Also. I highly recommend you check out the soundtrack. I’ve yet to be disappointed with the soundtrack from any of the Underworld films.